Rice pudding is a definite comfort food which has all the indulgent credentials of creamy ice-cream, warm custard and thick rolled oats. 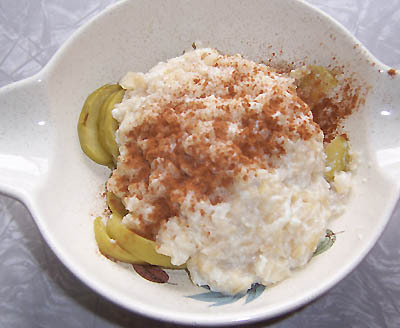 The only bad thing with shop-bought rice pudding is it’s full of calories from all the cream and is full of sugar. That’s why this recipe is excellent for anybody with digestive ailments or are simply trying to cut the calories. Tastes just like shop-bought rice pudding, only it’s naturally sweetened with lime juice and honey and instead of cream, it uses lots of gorgeous dairy-free nut milks and is made just as thick and creamy with natural yoghurt. If you want to make this completely dairy-free, drop the yoghurt. I only use natural yoghurt as it doesn’t disrupt any lactose intolerance issues due to its high bacteria content from laborious fermenting. Either way, it tastes great. Just ensure all the rice has soaked up the milk so it’s nice and thick without the use of yoghurt. Try it out – it’s gorgeous! In a pan, add the rice and both milks until boiling. Reduce the heat and simmer for 15 minutes, stirring to avoid the rice sticking. Uncover after the 15 minutes and continue to simmer for a further 10 minutes. After the 10 minutes the mixture should be fairly thick with the rice having fully absorbed the water. Add the rest of the ingredients and stir into the rice mixture. Leave to cool for 5 minutes before serving. Once ready to serve, drizzle a little more of the honey on top, and a few slices of fresh or fried apple with a sprinkling of cinnamon.